e-Sports comprises the competitive play of video games. Other terms include competitive gaming, professional gaming, e-sport, and cybersport. The most common video game genres associated with electronic sports are massively-multiplayer online (MMOG), real-time strategy (RTS), fighting, first-person shooter (FPS) and racing. Games are played competitively at amateur, semi-professional and professional levels, and some games have organized competition in the form of leagues and tournaments. Events such as Global Starcraft II League (GSL), Dreamhack, World Cyber Games (WCG), Major League Gaming (MLG) and Intel Extreme Masters provide both real-time casting of streamed games, and cash prizes to the winners. 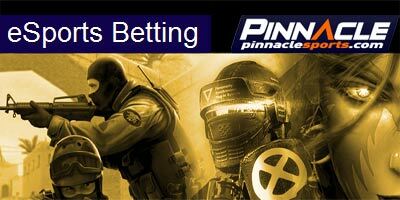 If you are new into sports betting, you are probably not familiar with Pinnacle Sports? Pinnacle Sports is the sportsbook with the highest odds online on any sports, guaranteed because they are working with only 2% margin! Coverage extends to all of the big leagues in both Starcraft 2 and Dota 2: GSL, MLG, DreamHack, IPL, NASL, ASUS ROG, The Defense, The International, etc... Luckily for both bettors and fans, it’s easy to get involved in the action as most league matches are streamed online and are free to watch. Asia is pretty big in this thing, for example watching live StarCraft matches in Korea is a popular form entertainment. Professional e-sport players earn big bucks, and in Asian countries, they enjoy an almost rock-star status. It might seem a bit weird, putting wagers on people playing StarCraft battles between Terrans and Aliens, but if you think about, a real-time strategy video game is like online poker or blackjack. You have to choose your winning strategy, you have to know your opponent. Sometimes you have to risk, sometimes you have to concentrate on building your resources. The excitement and the drama is there, the game can change in the very last second. Like in all other sports it is important to be well informed before making your bets. You have free access to a lot of information about the players in different eSport games. Replays, VODs and player streams are everywhere on the internet and on this site you find links to good community sites for this. Learn the players strenghts and weaknesses. In Starcraft2 you can always check out the players ladder ranking aswell on sc2ranks.com. Teamliquid.net, a prolific Starcraft team, has two Starcraft databases that make it easy to find this information - one for the International Leagues and one for South Korea. Mystarcraft.de also provides a Starcraft 2 Player rank with many useful stats for each player, including overall win rate, matchup win rate and map win rates. With new tactics being discovered and widely adopted over a period of just weeks, no other sport is as dynamic as the world of eSports. Because the world of eSports is so fluid, it’s quite possible for a well-informed eSport fan to know more about a match than a bookmaker and take advantage of inaccurate odds, and use your eSports betting knowledge and Pinnacle Sports account to make money. 1. Register and deposit in Pinnacle Sports. 3. Place a bet, by clicking on Starcraft 2 player/team you want to back. The table becomes clickable ONLY once you have registered and deposited. Also Irish international betting giant Paddy Power have entered the e-sports fray offering bets SAGE LAN event, featuring both Enemy Territory and Call Of Duty. Limits were placed on the maximum bet in order to prevent match fixing. "Betting on e-sports now available on Pinnacle"